Businesses are looking for more ways to reduce infrastructure costs without compromising service availability. This results in companies looking for newer cloud development architectures like serverless, giving rise to the need for event triggered integration across multiple third party services. Developers are turning to serverless solutions like Azure Logic Apps and Azure Functions to automate workflows and integrate systems, thereby accelerating application delivery and reducing costs. 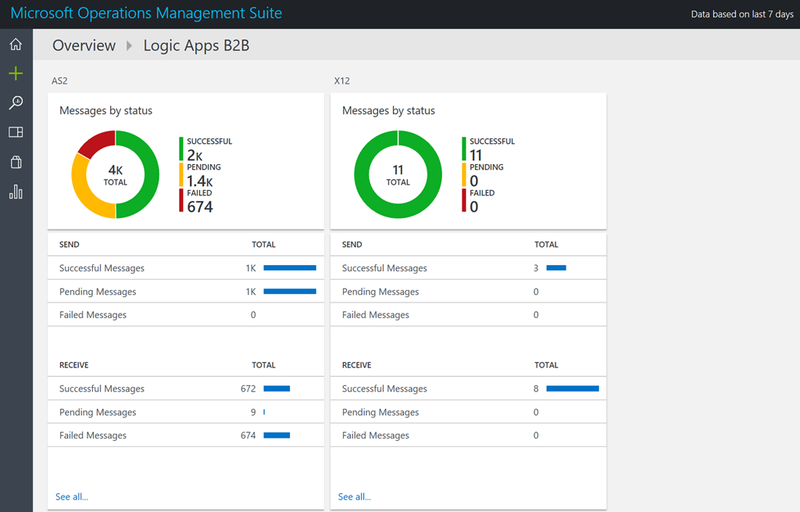 Logic Apps enables customers to quickly and easily build powerful integration solutions using a visual designer and a wide set of out-of-the-box connectors such as Dynamics CRM, Salesforce, Office 365 and many more. Today I am excited to announce another important milestone in integration- the general availability of Enterprise Integration Pack within Logic Apps, which further simplifies business-to-business (B2B) communications in the cloud. It enables you to more easily process business transactions reliably, track and troubleshoot B2B events and leverage additional out-of-the-box connectors. The ability to view and troubleshoot B2B events via system management solutions is as important as enabling comprehensive EDI capabilities. With the Enterprise Integration Pack, you can track B2B events in a number of flexible ways like built-in tracking which can be routed to Microsoft Operations Management Suite (OMS) using the out-of-the-box tracking portal. You can easily view and troubleshoot B2B transactions over AS2 and X12 formats (with EDIFACT coming in the next few weeks). Additionally, a new RESTful tracking API enables you to send tracking events from both Logic App executions as well as other applications for end to end visibility. You can also add and correlate tracking data across your entire business process in Operations Management Suite. We realize that many of our customers are often dealing with mission-critical applications and business processes that can lead to complex, time consuming connection configuration steps. With Logic Apps, we have added more enterprise connectors that make it simple and fast to establish connections with business applications. For instance, with the SAP connector, you can easily connect your on-premises SAP systems to cloud applications using Logic Apps without the need for complex coding required by other serverless products in the market. Today, the MQ Series and SAP ECC connectors are in preview, with more connectors coming in the next few months. For a full list of all currently available connectors, please visit the Logic Apps connectors reference. With the general availability of Enterprise Integration Pack, you can now start using these services in production with full SLA and support. We are committed to continuous delivery of serverless compute and integration capabilities and will continue to share updates about investments and new releases. In the meanwhile, learn more and try our serverless offerings – Azure Logic Apps and Azure Functions. As always, please share your comments and continue to engage with our Logic Apps and Functions teams. Also, be sure to check out Logic Apps pricing page and the documentation page on how you can start consuming these features today.